Z90 (XHTZ-FM) & LOCAL MEDIA SAN DIEGO, LLC ARE NOT RESPONSIBLE FOR ANY EVENT / PRIZE CHANGES AND / OR CANCELLATIONS. General rules may be picked up at 6160 Cornerstone Court East, Suite 150, San Diego, CA 92121, Monday – Friday during normal business hours. The sweepstakes will begin on February 11, 2019 and end on March 14, 2019. Listen for a “code word” to be announced weekdays on Z90 at 8:00AM, 9:00AM, 10:00AM, 11:00AM, 12:00PM, 1:00PM, 2:00PM, 3:00PM, 4:00PM, and 5:00PM. Participants have until the end of that hour to enter the announced code word in the designated entry form at www.z90.com. Every successful code word submitted represents an entry. Form must be completely filled out to qualify as an entry into the sweepstakes. One entry per person, per code word. Mail in and/or drop off code words as method of entry are accepted, each must include: Code word, date & time code word was announced, participant full legal name, mailing address, contact phone number, e-mail address and date of birth. Address is 6160 Cornerstone Court East, Suite 150, San Diego, CA 92121. Drop off available Monday through Friday, 9:00AM to 5:00PM. Mail in and drop off entries will not be returned to sender. Three additional code words eligible for entry at any time will be announced via the Station website and social media, and not on-air. Those words are: RICK, MONEY, LOCAL. Code words will not be announced Monday, February 18. The deadline to enter all code words is Thursday, March 14 2019 at 6:00PM (PST). Following the code word deadline, one (1) entry will be randomly selected out of those submitted, and declared winner following confirmation of eligibility requirements and compliance with all rules of the sweepstakes. One grand prize that may be awarded to an eligible winner is $10,000.00. Prizes subject to change without notice. Prizes will be announced on-air when given away. Prize winner is strongly advised to seek professional legal, tax advice. Awarding of prizes could have material adverse consequences on the winner including without limitation, with respect to taxes, income, government entitlements or other benefits, or other legal, financial or other matters. Prizes are not transferable or exchangeable for any other prize, and must be accepted in whole. If a winner cannot be contacted within 48 hours, or is disqualified, the Company reserves the right to determine an alternate winner or not to award that winner’s prize, in its sole discretion. Only one prize may be awarded per person and per household. Participants, contestants and winner(s) must be U.S. residents of San Diego County, at least 18-years old at the date of entry, have an active social security number, and be able to present the original social security card and California ID to officials before the prize is awarded. Entries will be confirmed by e-mail address, multiple entries of the same code word by the same person under a different email address will not be considered a valid entry. Employees of the Company, the Sweepstakes participating sponsors and their advertising agencies, employees of other radio or television stations, and members of the immediate family of any such persons are not eligible to participate and win. The term “immediate family” includes spouses, siblings, parents, children, grandparents, and grandchildren, whether as “in-laws,” or by current or past marriage(s), remarriage(s), adoption, co-habitation or other family extension, and any other persons residing at the same household whether or not related. By participating, all participants and winner(s) grant the Company exclusive permission to use their names, characters, photographs, voices, and likenesses in connection with promotion of this and other sweepstakes and waive any claims to royalty, right, or remuneration for such use. By participating in the Sweepstakes, participants agree that the Company may disclose personal information obtained from participants in the Sweepstakes to third parties and use such information for marketing and other purposes. Winners may be required to sign and return an Affidavit of Eligibility and Release of Publicity and Liability within 14 days of notification of winning. Failure to sign and return the affidavit and release within such period or to comply with any term or condition of these Official Rules may result in disqualification and forfeiture of any interest in a prize. By participating, each participant and winner waives any and all claims of liability against the Company, its employees and agents, sponsors and their respective employees and agents, for any personal injury or loss which may occur from the conduct of, or participation in, the Sweepstakes, or from the use of any prize. In order to receive a prize, participants must sign an official waiver form provided by the Company. The company assumes no responsibility for any error, omission, interruption, deletion, defect, delay in operation or transmission, communications line failure, theft or destruction or unauthorized access to, or alteration of entries. The company is not responsible for any problems or technical malfunction of any telephone network or lines, computer on-line-systems, servers or providers, computer equipment, software, failure of email, technical problems or traffic congestion on the Internet or at any website or combination thereof, including injury or damage to participants or to any person’s computer or data related to or resulting from participating or downloading materials in this Web site or Sweepstakes. The company is not responsible for cheating or fraud by any entrants. Any activities intended to disrupt or interfere with the proper play of the Sweepstakes, or to defraud the Sponsor in any way, may be prosecuted to the fullest extent of the law. Participants engaging in any of the foregoing activities will be disqualified and will forfeit any prizes won. If, for any reason, the Sweepstakes is not capable of operating as planned, including, without limitation, as a result of infection by computer virus, bugs, tampering, unauthorized intervention, fraud, technical failures, or any other causes beyond the reasonable control of the company which corrupt or affect the administration, security, fairness, integrity or proper conduct of this Sweepstakes, the company reserves the right at their sole discretion to cancel, terminate, modify or suspend the Sweepstakes and award prizes among eligible entries received. By participating in the Sweepstakes, participants agree to be bound by the decisions of Company personnel. The Company reserves the right to disqualify any participant or winner and may refuse to award any prize to a person who is ineligible or who the Company believes has violated any rule, gained unfair advantage in participating in the Sweepstakes, or obtained winner status using fraudulent means. The Company will interpret these rules and resolve any disputes, conflicting claims or ambiguities concerning the rules or the Sweepstakes and the Company’s decisions concerning such disputes shall be final. If the conduct or outcome of the Sweepstakes is affected by human error, any mechanical malfunctions or failures of any kind, intentional interference or any event beyond the control of the Company, the Company reserves the right to terminate this Sweepstakes, or make such other decisions regarding the outcome as the Company deems appropriate. All decisions will be made by the Company and are final. The Company may waive any of these rules in its sole discretion. Each winner must submit proof of eligibility and sign the Company’s release form to claim the prize. No purchase necessary to participate or win. Purchase does not increase chance of winning. Void where prohibited. Odds of winning depend upon the number of participants. The Company may substitute prizes, amend the rules or discontinue the Sweepstakes at any time as announced on the Station(s). The Company disclaims any responsibility to notify participants of any aspect related to the conduct of the Sweepstakes. Written copies of these rules are available during normal business hours at the business offices of the Station(s) and by mail upon written request with a stamped, self-addressed return envelope. 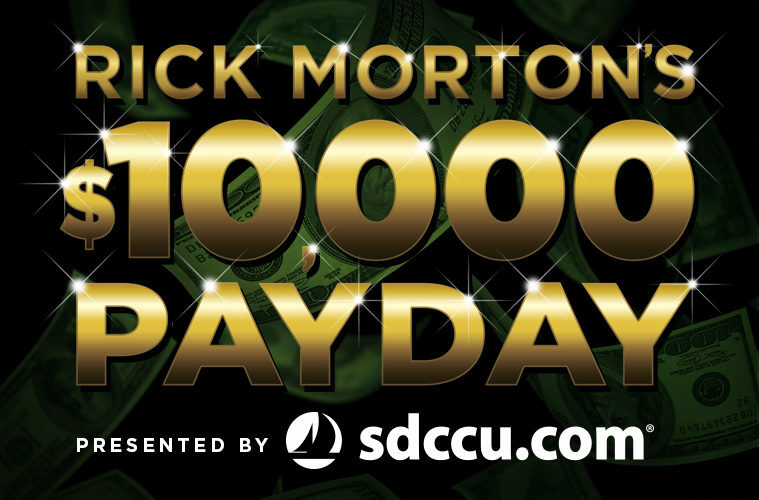 For a Winner’s List, available thirty (30) days following the end of the Sweepstakes Period, send a self-addressed, stamped envelope to: Local Media San Diego, 6160 Cornerstone Court, East, Suite 150, San Diego, CA 92121. Please include the following in your Winner’s List request: Your full legal name, name of station and indicate which winner’s list you would like to receive. Please include one self-addressed, outer postmarked envelope for every list requested. The conduct of the Sweepstakes is governed by the applicable laws of the Unites States of America, which take precedence over any rule to the contrary herein. Station(s) shall follow the applicable laws for conducting sweepstakes, including notice to the state attorney general or consumer affairs office, posting of a prize bond, furnishing lists of winners, running specific on-air disclaimers, providing specific written information about the Sweepstakes, etc. as required by local and state law.